The Global Eco Forum returns to Barcelona (24 - 25 - 26 October 2011) to be an essential appointment for the opinion leaders and actors of the change towards the sustainability in the Euro-Med region. One more year, after the big success of the three previous editions, eco-union prepares the Global Eco Forum 2011, with a special approach on Green Economy and governance of sustainability, on the way towards the Rio 2012 Earth Summit. The event will take place on the 24th, 25th and 26th October in La Pedrera (Barcelona). This year, Nektarina joins Global Eco Forum in the capacity of an international partner, and it is our pleasure to invite you to reserve these dates in your agenda! 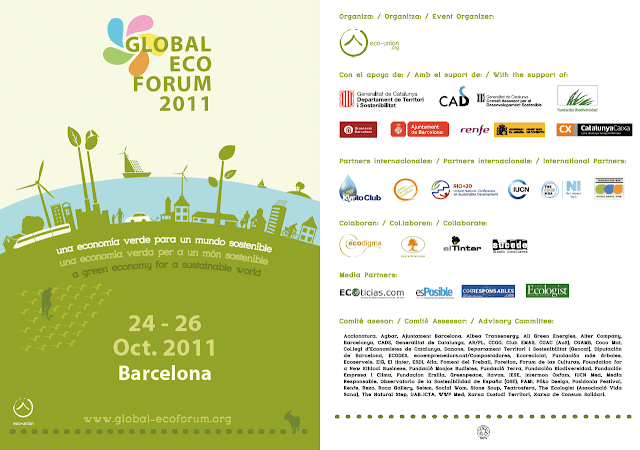 Take a look at pre-programme for GEF2011 and for Open Registrations please visit the link here. We are looking forward to seeing you in Barcelona this October!